WarmTrax portable heated traction mats offer an effective and affordable solution for keeping sidewalks, ramps, steps, and porches free of snow and ice. Designed with a continuous chevron pattern to provide extra traction, the snow melting mats also provide an effective solution for slip prevention by keeping surfaces safe in rain as well as free from slick ice. WarmTrax portable heated mats are a great alternative to embedded snow removal systems for heating walkways, ramps and high-traffic areas. This cost effective solution makes safe sidewalks and entryways a viable option for homeowners and businesses. Heated stair treads are also available from WarmTrax. 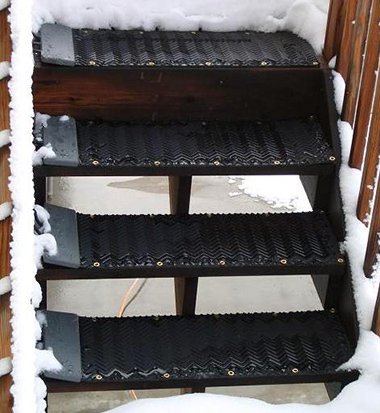 The stair treads can be easily used to melt ice from outdoor steps and stairways. The durable rubber and aluminum treads are designed to be daisy-chained together to cover long stair cases or just a few steps up to a porch. The treads can be linked to heat as many steps as needed. Available in aluminum or rubber, these convenient snow melting solutions are a popular means of enhancing safety, and the systems are built to last, and are very easy to use. The WarmTrax products are made of the highest quality materials so they can withstand harsh weather and repeated use. WarmTrax products consist of a durable heating element sandwiched between two high-grade, protective surfaces of customized non-slip thermoplastic material. 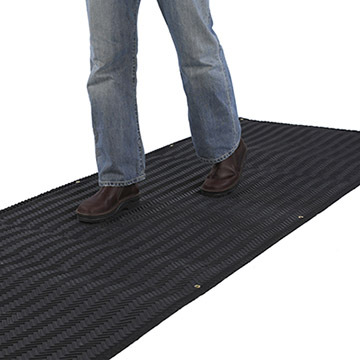 The design and construction of the mats make them as durable as automobile tires. And speaking of automobiles, the rugged mats are durable enough to withstand the weight of your car. Create your perfect driveway snow removal and snow melting solution without tearing up your asphalt or concrete driveway to install an expensive system. Eliminate back breaking work shoveling snow and black ice, and reduce stress by not being late to work again during the winter months. WarmTrax mats come with a 2-year manufacturer warranty. The heated mats and stair treads plug directly into any standard 120V or 240V outlet using its own equipment leakage circuit interrupter (ELCI). With the mats' built-in watertight connector cables, you can connect residential mats to create your perfect snow melting solution — all on a single plug! To learn more about the many different portable snow melting and heated mat options, call 888-488-9276 today. In addition to the portable heated mats, Warmzone also offers embedded radiant heat snow melting systems and free installation training. Visit Warmzone.com or call today. WarmTrax portable heated stair treads in use. 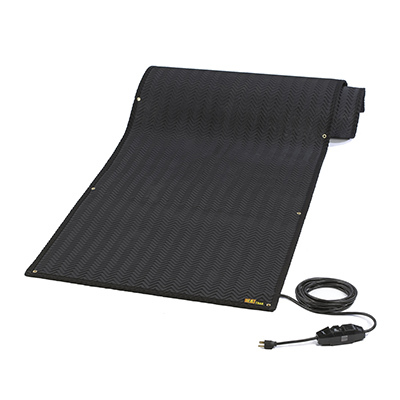 WarmTrax portable rubber heated traction mat. 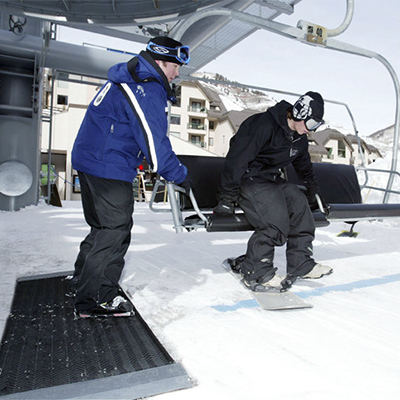 Portable heated traction mat being used at ski lift. To learn more about your snow melting, roof deicing, or floor heating options, visit Warmzone.com or call a friendly radiant heat expert today, at 888-488-9276. WarmTrax Portable Snow Melting Mats - warmtrax.com © . All rights reserved. Various trademarks held by their respective owners.